Former Oxford County Democratic Party Chair Cathy Newell was sitting in the party’s Bethel office on Wednesday, where you could pick up a sign supporting independent U.S. Sen. Angus King’s 2018 re-election bid. You’d just have to get it from her car. AUGUSTA, Maine — Former Oxford County Democratic Party Chair Cathy Newell was sitting in the party’s Bethel office on Wednesday, where you could pick up a sign supporting independent U.S. Sen. Angus King’s 2018 re-election bid. You’d just have to get it from her car. That’s because Newell of Greenwood thought it better not to bring signs for non-Democrats inside, even though many of the same people who volunteer for phone banks that Newell organizes for King also make calls for Democrats. 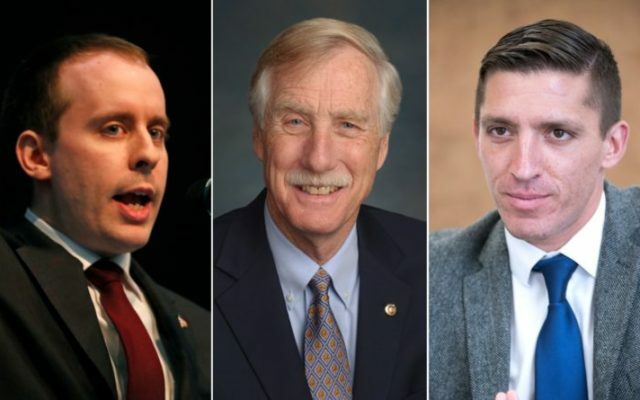 To read the rest of “Angus King quietly tries to fend off challenges from opposite ends of political spectrum,” an article by contributing Bangor Daily News staff writer Michael Shepherd, please follow this link to the BDN online.